← Which Athletics Hit the Giants? What’s the Matter With RBI? Bengie Molina hits the game-winning home run in the eleventh inning against the Padres, April 8, 2008. 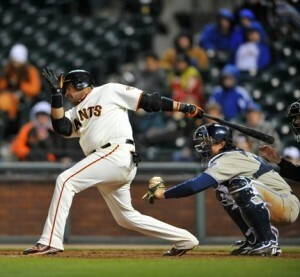 As of May 9, Brandon Belt, since placed on the DL with a broken thumb, was on a pace for 41 home runs but only 83 RBI. Brisbee asserts that these numbers, along with the 175 strikeouts Belt was on pace for, if they actually happened, would provide a lot of “talk radio fun.” And they would, because callers would complain about the paucity of RBI. RBI are what get a player MVP awards, they are what garner plaudits for determination and confidence under pressure. As Jonah Keri has observed, for the typical sportswriter, RBI generators dwell on a higher moral plane than the rest of the world. Of the three Triple Crown stats, RBI may be the most flawed. In their groundbreaking book, The Hidden Game of Baseball, John Thorne and Pete Palmer reveal that the debate over the stat’s usefulness began well before Moneyball, Bill James or even Branch Rickey. The RBI was introduced by a Buffalo newspaper in 1879, and then picked up by the Chicago Tribune, which in the words of Preston D. Orem, “proudly presents the ‘Runs Batted In’ record of the Chicago players for the season, showing Anson and Kelly in the lead.” Readers, though, were unimpressed. Objections were that the men who led off, Dalrymple and Gore, did not have the same opportunities to knock in runs. The paper actually wound up almost apologizing for the computation. Even 135 years ago, baseball fans understood how context-dependent a stat RBI was. First, they recognized that leadoff hitters were at a disadvantage when it came to RBI opportunities. In his first plate appearance, a leadoff man could hope to drive in only himself with a home run. For the rest of the game, leadoff hitters must follow the back of the lineup, the weak hitters in the eight and nine slots. While there are exceptions, most teams tend to follow something resembling an optimal lineup, with players who get on base more frequently batting toward the top of the order. The result is that middle-of-the-order hitters, whatever their ability, usually have the most RBI chances. The sheer number of plate appearances a player accumulates in a season plays a huge role in a player’s RBI total. While the leadoff hitter and a number nine hitter may both find their RBI chances restricted by the mediocre batters hitting in front of them, the leadoff man will gain more chances simply by having more times at bat. Roughly speaking, for every lineup spot a player moves up, he gains twenty plate appearances over a full season. Thus, when Dusty Baker penciled Tsuyoshi Shinjo or Tom Goodwin or Marvin Benard into the leadoff spot for 53 games in 2002, he was giving his worst hitters more chances to squelch potential rallies. While RBI aren’t indicative of a player’s greatness, great players — legitimate superstars like Willie Mays and Barry Bonds — tend to accrue them in high numbers. There is a simple reason: Most managers have a pretty good idea who their best players are, so a Mays or Bonds is likely to bat in the middle of his team’s lineup. That way the player’s true ability combines with greater opportunity to produce RBI numbers. It’s a key distinction: Barry Bonds wasn’t a great player because he got a lot of RBI. Rather, he got a lot of RBI because he was a great player who got a lot of RBI opportunity. Opportunity alone can often bring big RBI totals for lesser players. Just in this century, three San Francisco Giants have gotten 90 or more RBI while having a below-major-league average OPS+. In 2004, Marquis Grissom knocked in 90 runs while hitting .279/.323/.450 (97 OPS+). He could do this because he almost always hit third in the order in the first half of the season, a season when Ray Durham, leading off, had the second-best offensive season of his career. J.T. Snow had the best season of his career (.327/.429/.529, 146 OPS+) and in that first half hit second between Durham and Grissom. In 2006, Pedro Feliz had 98 RBI while hitting .244/.281/.428 (79 OPS+). Feliz usually hit seventh, but he was fortunate in the situations in which he hit. Feliz had a total of 437 men on base over the course of his 2006 plate appearances. This was not only the most for any Giant, but 66 more than those for Ray Durham, Feliz’s next-closest teammate in the category. In 61 plate appearances, Feliz came to bat with a runner on third base with fewer than two outs. Again, this was the most such plate appearances for any Giant that season, and 25 more than Durham, also next closest by this measure. 2008 was the season Bengie Molina infamously batted cleanup for the Giants, driving in 95 runs while hitting .292/.323/.450 (98 OPS+). Molina led the National League with 11 sacrifice flies, which both demonstrated the RBI opportunities a cleanup hitter has, and underscored Molina’s lack of power. Molina led the team in baserunners (409) when he was at the plate, nine more than Aaron Rowand enjoyed, and much more than the 350 Randy Winn, who was third on the team list, saw. Of the nine major league players with at least 500 plate appearances while batting fourth in their team’s order in 2008, Molina’s OPS was ninth, at .771, 69 points behind Adrian Gonzalez, who was eighth on the list, and 195 points behind the leader, Manny Ramirez. So it’s entirely possible, especially in eras conducive to run-scoring, to get a lot of RBI and still be a relatively ineffective batter. Highly context-dependent counting stats like RBI can be inflated or deflated by many factors that have nothing to do with the batter’s true abilities, including their total number of plate appearances and the on-base percentage of batters in front of them. We don’t want to make the mistake of labeling someone as a “run-producer” or “clutch” when in fact they are just the beneficiary of greater opportunities. This entry was posted in Uncategorized and tagged 2004 Giants, 2006 Giants, 2008 Giants, Aaron Rowand, Bengie Molina, Brandon Belt, J.T. Snow, Marquis Grissom, Pedro Feliz, Randy Winn, Ray Durham, statistical analysis. Bookmark the permalink.